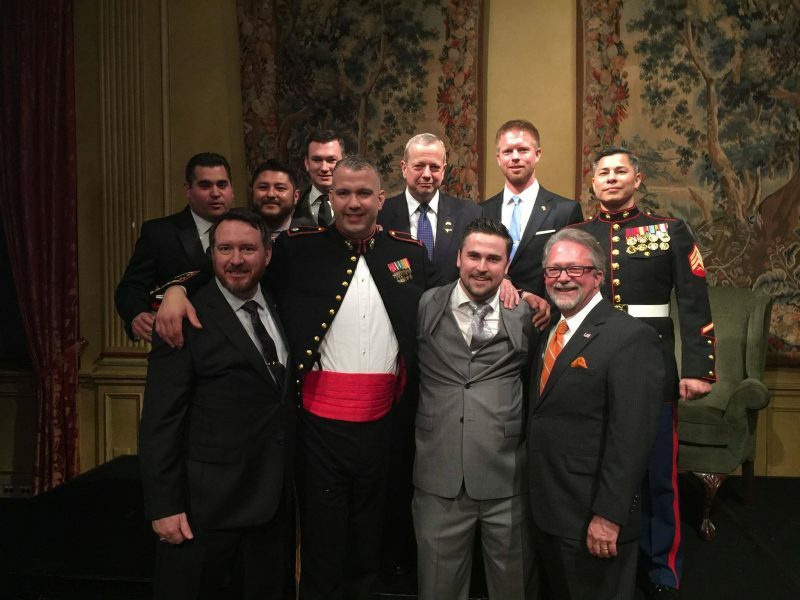 Cowtown Warriors Ball is a function of the Metroplex Marines Coordinating Council operating under the 501(c)(3) Metroplex Military Charitable Trust. The U.S. Marines are all about tradition, so it makes sense that an organization led by 16 Marines and one Army grunt would be formed in a bar. At the Fort Worth Club. “The Marine Corps was formed in a bar in 1775, and I like to say the Cowtown Warriors were formed in a bar in 2013, and that’s really what’s brought us together,” says Richard Wegner, president of the organization. He’s speaking of Tun Tavern in Philadelphia, where the first Marines were recruited after the Continental Congress called for the branch’s creation Nov. 10, 1775. But the Cowtown organization is not just for Marines. It is for “quality of life assistance for local disabled veterans,” Wegner said. And “local” is loose definition, meaning all of North Texas. There were four in the initial group: founder Jeremy Spann, managing partner at Stoneburgh Management and an international real estate sales consultant with Briggs Freeman Sotheby’s International Realty; David Goodroe, president and CEO of the Fort Worth design/build firm Designs for Living; James Korth, an attorney in private practice in Fort Worth; and Terry Ryan, a longtime Fort Worth banker and former president of the Fort Worth Chamber of Commerce. Goodroe was the only Army guy in the bunch. They decided to put on a fundraiser, the Cowtown Warriors Ball. There have now been four Cowtown Warrior Balls, raising about $450,000. Of that, the organization has disbursed about $330,000 to qualified disabled veterans for assistance with items such as wheelchair-accessible ramps, rent assistance and even special beds. “Anybody who shows up to the event, buys a raffle ticket, purchases a table or writes a check for anything, 100 percent of that money goes into an account that is earmarked for disabled veterans,” Wegner said. That’s because Power Service Products, a family- and veteran-owned diesel fuel additives company founded in 1956 and based in Weatherford has been the underwriting sponsor. The fifth ball is scheduled for Feb. 24 at the Fort Worth Club. Like the Marine Corps, Cowtown Warriors is lean and mean ¬– no paid staff, no offices and all volunteer. Decisions are made by the board at its monthly meeting the second Thursday of the month at the Fort Worth Club. Keeping the bar tradition going, you know. There are many services for disabled U.S. veterans, but they may have needs that go unaddressed. Examples might include the need for a special bed or help with making a home wheelchair-accessible or even short-term financial aid when disability checks get interrupted. Disabled veterans can apply through the Cowtown Warriors website cowtownwarriors.com. They must supply copies of their Certificate of Release or Discharge from Active Duty – commonly known as a DD214 – and a copy of their Veterans Administration Disability Awards Letter. But that’s just the start of the process, and the next step – verifying the information – was a bottleneck in the early days, Wegner said. Goodroe is a long-time community volunteer in a variety of ways, including being on the board of Goodwill Industries of Fort Worth, where he has been chairman. Since he’s on both boards, he connected Cowtown Warriors to Goodwill’s Vet Worthy program, which provides veterans, spouses, children and caretakers with connections to career and financial planning, job development and skills training support. Vet Worthy has been partnering with Cowtown Warriors for about a year to do the verification that was time consuming for an all-volunteer organization with no paid staff. Vet Worthy benefits, too, says David Cox, president and CEO of Goodwill. Its primary mission is helping veterans return to civilian life, with a focus on employment. But there may be other needs beyond the scope of the Goodwill program, such as housing, food, transportation, tools needed for job searches. The Cowtown Warriors website gets five to 10 requests a month, and with Vet Worthy involved it could take less than 24 hours to get back to an applicant and start the process of determining whether he or she qualifies for assistance. Not everyone qualifies for help. “If they haven’t demonstrated ability to want to help themselves, we are much less likely to try to help them. If they’re trying to help themselves, absolutely we’ll try to set you up for success,” Wegner said. The requests can be heartbreaking. Take beds, for example. Wegner says a lot of disabled veterans have trouble sleeping in their beds and just want to be able to sleep with their spouse again. His organization has bought several Tempur-Pedic or similar mattresses for that reason. One such veteran is Omar Milan, 35, who enlisted in the Marine Corps in 2000 and served one tour in Iraq as a field radio operator before being discharged in 2004. He later enlisted in the Air Force Reserve and trained as an explosive ordnance disposal technician. And then he reenlisted in the Marine Corps and was deployed twice during Operation Enduring Freedom in Afghanistan. On that second deployment, he was with a team gathering evidence from a blast from an IED – an improvised explosive device, commonly used as a roadside bomb – on Jan. 9, 2012. Milan had placed a disposal charge on an IED to destroy it and was walking away when he stepped on another that metal detectors had not located. He lost his right leg below the knee and suffered severe damage to his left calf, both hands and his right elbow as well as other injuries. He remembers the pain from a broken collar bone but not much more until he woke up in a military hospital a month later. He had vague memories of his 30th birthday. He would be in the hospital for two years. Milan moved back to Texas in the summer of 2014. He and his wife of 14 years, Michelle, live in Mansfield with their two daughters, Rachael, 13, and Vanessa, 9. But the wives will talk. So Cowtown Warriors supplied a Tempur-Pedic bed. Milan was a little reluctant but agreed to accept it. “It helps a lot. I mean, I’m not 100 percent back to where I’m pain-free, but it’s better than where I was,” he said. He’s now on the board of Cowtown Warriors as recipient liaison, following up with those receiving assistance. They’ll talk with him because he’s one of them. “We’ve paid rent for people to avoid eviction. We bought bicycles for students who need to get around campus. We remodeled several homes, widening the doorways, tearing up carpet, putting wood floors down because they have mobility issues and they’re in a wheelchair. We’ve paid for some school,” Wegner said. There’s an old joke that you can always tell a Marine, but you can’t tell them much. And that’s sort of how Wegner got involved with Cowtown Warriors after the first ball. Tim Hatcher is secretary of the board of Cowtown Warriors and vice president for The Pacific Group, a retirement company for businesses and individuals. Both he and Wegner work in the Burnett Plaza building downtown. “I step on an elevator having never met Tim before in my life, and he just looked me up and down and says, ‘Are you a Marine?’ which actually happens with some frequency, believe it or not,” Wegner said. They stepped off the elevator and talked for 10 or 15 minutes, and Hatcher told him about the Cowtown Warriors organization. “That’s how I got a foot in the door,” Wegner said. “I’ll be honest with you, it was very unorganized. All we knew is that we wanted to raise some money and we’re going to throw a party. “You had probably 10 or 15 folks sitting around the table drinking and figuring out how to do that. It was probably 50 percent war stories, probably 20 percent jokes and then 30 percent let’s find out how we throw this event,” he said. By the way, if you want to know how they recognize each other, it’s the posture and the walk. And sometimes the eyes. And that’s not just confined to Marines. Cowtown Warriors would like to increase its visibility in the community. The organization has had no trouble selling out its events, Wegner says, but there may be others out there looking for a way to assist disabled veterans, whether that is direct donations, sponsorships at the ball, buying tables or volunteering. Money beyond the annual ball would allow Cowtown Warriors to do more than it already does. The military services operate Warrior Transition Units – closely resembling line units – at bases and major military treatment facilities so that wounded veterans can focus on healing before rejoining military units or returning to civilian status. Some are community-based, meaning that the service member can return home while basically remaining in the military and complete his or her rehabilitation with local physicians and other medical personnel. The first Cowtown Warriors fundraising was in partnership with the Wounded Warrior battalion in Quantico, Virginia. “But now it’s grown to all disabled veterans – not just that very specific wounded warrior regiment out of Quantico but any branch,” Wegner said. Cowtown Warriors operated under the umbrella of a 501(c)(3) organization called Metroplex Marines Charitable Trust in Dallas, and that makes donations tax-deductible. Wegner says the board plans to discuss whether to maintain that relationship, partner with some other organization in Fort Worth or create its own 501(c)(3) nonprofit. Of course, that will happen in the bar at the Fort Worth Club.